In this study, trained models were obtained by using Artificial Neural Network (ANN) in order to determine the equivalent stress levels of one dimensional functionally graded rectangular plates. In this training set, a single layer sensor model was used according to our linear problem. With ANN, the models were trained by changing parameters the number of different iterations, number of neurons and learning algorithms. and the trained model was tested and its performance was measured. In our study, thermal stress analyses were performed for different compositional gradient exponents using finite difference method to constitute data sets. The data sets were constructed for the smallest value of the largest value of the equivalent stress levels, the greatest value of the greatest value of the equivalent stress levels, the greatest value of the smallest value of the equivalent stress levels, and the smallest value of the smallest value of the equivalent stress levels. Five different training algorithms were used in our training network: Levenberg-Marquardt, Back Propagation Algorithm, Momentum Coefficient Back Propagation Algorithm, Adaptive Back Propagation Algorithm and Momentive Adaptive Back Propagation Algorithm. The Levenberg-Marquardt algorithm is found to be more efficient than the other algorithms. With this study, trained models have been developed to provide time and job savings to determine equivalent stress levels in functionally graded plates, which are very important for high temperature applications. These educated models will provide important contributions to the literature and will be a source for the work to be done in this regard. Functionally graded plates, artificial neural network, single layer model, Levenberg-Marquardt algorithm, finite difference method, thermal stress analysis. Kakac, S., Pramuanjaroenkij, A., Zhou, X.Y., ‘‘A review of numerical modeling of solid oxide fuel cells’’, International Journal of Hydrogen Energy, vol.32, no.7, pp.761-786, 2007. Ruys, A., Popov, E., Sun, D., Russell, J., Murray, C., ‘‘Functionally graded electrical/thermal ceramic systems’’, Journal of the European Ceramic Society, vol. 21, no.10-11, pp.2025-2029, 2001. Koizumi, M., Niino, M., ‘‘Overview of FGM research in Japan’’, MRS Bulletin, vol.20, no.1,pp.19-21, 1995. Natali, M., Romanato, F., Napolitani, E., Salvador, D.D., Drigo, A.V., ‘‘Lattice curvature generation in graded InxGAs/GaAs buffer layer’’,Physical Review B, vol.62, no.16, pp.11054-11062, 2000. Natali, M., Romanato, F., Napolitani, E., Salvador, D.D., Drigo, A.V., ‘‘Lattice curvature generation in graded InxGAs/GaAs buffer layer’’,Physical Review B, vol.62, no.16, pp.11054-11062, 2000. Noda, N., ‘‘Thermal Stresses Intensity Factor for Functionally Gradient Plate With an Edge Crack’’, International Journal of Thermal Stresses, vol.22, no.4-5, pp.477-512, 1999. Shabana, Y.M., Noda, N., ‘‘Thermo-elastic-plastic stresses in functionally graded materials subjected to thermal loading taking residual stresses of the fabrication process into consideration’’, Composites Part B: Engineering, vol.32, no.2, pp.111-121, 2001. Praveen, G.N., Reddy, J.N., ‘‘Nonlinear transient thermoelastic analysis of functionally graded ceramic-metal plates. International Journal of Solids and Structures’’, vol.35, no.33, pp.4457-4476, 1998. Turteltaub, S., ‘‘Optimal control and optimization of functionally graded materials for thermomechanical processes’’, International Journal of Solids and Structures, vol.39, no.12, pp.3175-3197, 2002. Cho, J.R., Ha, D.Y., ‘‘Optimal tailoring of 2D volume-fraction distributions for heat-resisting functionally graded materials using FDM’’, Computer Methods in Applied Mechanics and Engineering, vol.191, no:29-30, pp.3195-3211, 2002. Ootao Y., Tanigawa Y., Nakamura T., ‘‘Optimization of material composition of FGM hollow circular cylinder under thermal loading a neural network approach’’, Composites Part B: Engineering, vol.30, no.4, pp. 415-422, 1999. Na, K. S., Kim, J.H., ‘‘Volume fraction optimization for step-formed functionally graded plates considering stress and critical temperature’’, Composite Structures, vol.92, no.6, pp.1283-129092:1283-1290, 2010. Xiang,Y., Zhou,Y., ‘‘A dynamic multi-colony artificial bee colony algorithm for multi-objective optimization’’, Applied Soft Computing, vol.35, pp.766-785, 2015. Nemat-Alla, M., ‘‘Reduction of thermal stresses by developing two-dimensional functionally graded materials’’, International Journal of Solids and Structures, vol.40, no.26, pp.7339-7356, 2003. Baykasoğlu, A., Özbakır, L.,Tapkan, P., ‘‘Artificial bee colony algorithm and its application to generalized assignment problem’’, Swarm Intelligence: Focus on Ant and Particle Swarm Optimization, vol.532, ISBN 978-3-902613-09-7, 2007. Cho, J.R., Shin, S.W., ‘‘Material composition optimization for heat-resisting FGMs by artificial neural network’’, Composites Part A: Applied Science and Manufacturing, vol.35, no:5, pp.585-594, 2004. Ali, M.M., Khompatraporn, C., Zabinsky, Z.B., ‘‘A Numerical Evaluation of Several Stochastic Algorithms on Selected Continuous Global Optimization Test Problems’’, Journal of Global Optimization, vol.31, no.4, pp.635-672, 2005. Bouchafa, A., Benzair, A., Tounsi, A., Draiche, K., Mechab,İ. Adda Bedia, E.A., ‘‘Analytical modelling of thermal residual stresses in exponential functionally graded material system’’,Materials & Design, vol.31, no.1, pp.560-563, 2010. Ghannadpour, S.A.M., Ovesy, H.R., Nassirnia, M., ‘‘Buckling analysis of functionally graded plates under thermal loadings using the finite strip method’’, Computers & Structures, vol.108-109, pp.93-99, 2012. Ootao, Y., Kawamura, R., Tanigawa, Y., Nakamura, T., ‘‘Neural network optimization of material composition of a functionally graded material plate at arbitrary temperature range and temperature rise’’, Archive of Applied Mechanics, vol.68, no.10, pp. 662-676, 1998. Ootao, Y., Kawamura, R., Tanigawa, Y., Imamura, R., ‘‘Optimization of material composition of nonhomogeneous hollow sphere for thermal stress relaxation making use of neural network’’, Computer Methods in Applied Mechanics and Engineering, no.18, no. 1-2, pp. 185-201, 1999. Celal Öztürk, ‘‘Yapay Sinir Ağlarının Yapay Arı Kolonisi Algoritması İle eğitilmesi’’, Erciyes Üniversitesi Fen Bilimleri Enstitüsü, Bilgisayar Mühendisliği, Ocak, 2011. Rumelhart, D.E., Hinton, G.E., Williams, R.J., ‘‘Learning representations by backpropagation errors’’, Nature, vol.323, pp.533-536, 1986. Zurada, J.M., ‘‘Introduction to Artificial Neural Networks’’, West Publishing, 1992. Manngard, M., Kronqvist, J., Böling, J.M., ‘‘Structural learning in artificial neural networks using sparse optimization’’, Neurocomputing, vol.272, no.10, pp.660-667, 2018. Hagan, M.T., Menhaj, M., ‘‘Training feed-forward networks with the Marquardt algorithm’’, IEEE Transactions on Neural Networks, vol.5, no.6, pp.989-993, 1994. Metrotra, K., Mohan, C.K., Ranka, S., Elements of artificial neural networks, 1997. Oğuz, M.,Yalıtkan malzemelerde elektiriksel dayanımın yapay sinir ağları ile belirlenmesi, İstanbul Teknik Üniversitesi Fen Bilimleri Enstitüsü, Elektrik Mühendisliği Haziran, 2001. Parlos, A.G., Muthusami, J., Atiya, A.F, ‘‘Incipient fault detection and identification in progress systems using accelerated neural network learning’’, Nuclear Technology, vol.105, pp.145, 1994. MATLAB. Mathematical software, version 2009a, TheMathWorks.Available: http://www.mathworks.com. ISNAD Demirbaş, Munise Didem , Sofuoğlu, Didem . "Thermal Stress Control in Functionally Graded Plates with Artificial Neural Network". 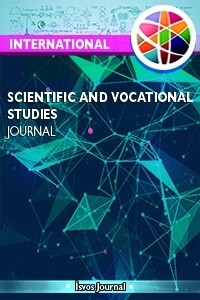 International Scientific and Vocational Studies Journal 2 / 1 (June 2018): 39-55.